THIS IS THE CLASSIC MAINE VACATION THAT DREAMS ARE MADE OF. The scent of wood smoke and pine. The haunting echo of a loon on a misty, morning pond. Moose wading at the shoreline. Visit our website link below for a lot more photos, video and information. The architecture of the home interiors is an open concept; T&G pine walls, stone and pine floors, high beamed ceilings w/sky lights and lots of glass and decks to enjoy the views. Each season on the Pond is a truly, unique experience. In SUMMER swim crystal clear water; enjoy virgin trout fishing just outside your door. Sail or canoe on the Pond, breathe in the view before an evening cookout. AUTUMN on the Pond is breath taking! A blaze of color reflects upon the mirrored surface on the Pond. It's a perfect time for hiking, Mt. Biking, some late golf or trout fishing: spectacular photography. WINTER? Ski Sunday River or Mt. Abram. It's a snowmobile paradise! Sled from your door across miles of Maine's trail system. While at the house, build a bonfire, make hot chocolate and skate in the shadow of the mountains on the Pond. Snowshoe or X-Country ski an untouched winter wonderland. Or, just cozy up beside the fireplace with someone special and enjoy the quiet of the winter woods. Both homes have mountain and water views. Check it out!!! My son built this. Ever since he was a boy he had wanted to be writer. He read everything that Hemingway wrote. I guess he was as caught up in the legend of Ernest Hemingway—who the man was and how he lived his life—as much as he was moved by Hemmingway's crisp, efficient prose. Neil Young, for him, is to music what Hemingway is to American literature. As that young boy he insistently listened to Neil Young, began to write and dreamed one day of building a place in the mountains, on a peaceful lake in beautiful Maine. He took his time. He searched to find that idyllic place that he had imagined. That’s how we found Shagg. It is a secluded paradise of green forest, on the shore of crystal clear-spring-fed water. The lake is nestled in a mountain valley. 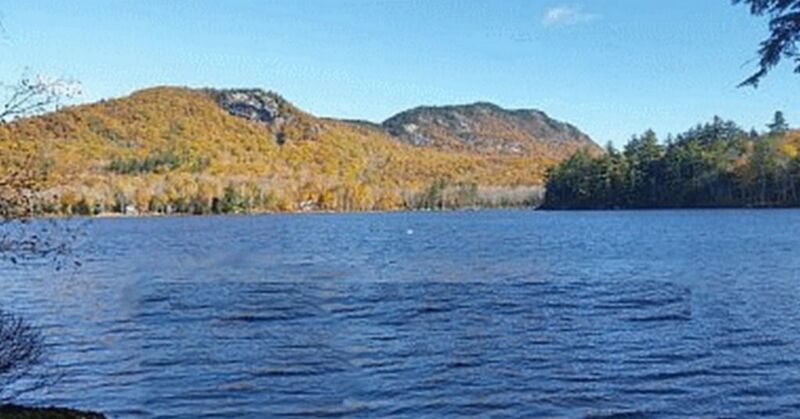 At the northern tip, the granite face of Bald Mountain rises up and reflects down upon the water. The moose… The loons… The massive trout… He built the grand house and a guest house and a large New England barn. I invite you and your loved ones to come share a get-away on the lake in Maine he used to dream about. It’s difficult to decide which season I like best up on Shagg. Of course, Summer is amazing. I love to swim and fish and hike Bald Mountain. The views are breathtaking. I love the wild sounds just before dusk when loons are settling down for the day. Then I want to say Autumn because the lake is ablaze with vibrant color. The sky is that beautiful rich blue. And the air is cool, crisp, sprinkled with the scent of wood smoke. When I think of Winter, I think of stillness. Quiet. Deer tracks in the snow outside the door. Getting on a snowmobile under starlight chasing shadows along a mountain trail. Now that I think about it, what I like best is when someone like you writes in our guest book, “We had the best time together here.” Then you talk about how you made the mountains and the lake and the house yours. How this place will always be apart of you. How you will always be a part of it. That’s exactly the place I told you about. It’s that place my son dreamed of creating when he was a little boy. Oxford Casino only 20 minutes away!!!! Visit the link to discover all of the features Oxford Casino offers. The best of both worlds. A private retreat in the mountains with a casino down the road. Enjoy the boats and canoes, swim, fish and explore this mountain spring fed Maine pond. 300' of private shoreline with mountain views and Moose, Loons, sunrises, green forest. Surrounded by mountains, the Pond is nestled in a remote valley bringing you and your family back to a classic Maine when life was much simpler. Enjoy the Swing at the water's edge and daydream. are provided which includes all bedding (sheets, pillow cases, blankets and comforters). Towels are not included. Each season on the pond is a truly unique experience. In Summer, swim crystal clear water; enjoy virgin trout fishing just outside your door; sail or canoe on the pond; breathe in the view before an evening cookout. Autumn on the pond is breathtaking! A blaze of color reflects upon the mirrored surface on the pond. It's a perfect time for hiking, mountain biking, some late golf or trout fishing. Spectacular photography. What about winter? There's Sunday River and Mt. Abram. It's a snowmobilers paradise! Sled from your door across miles of Maine's system. Build a bonfire, make hot chocolate and skate in the shadow of the mountains around the pond. Snowshoe, cross-country ski a winter wonderland, or just cozy beside the fireplace with someone special and enjoy the quiet of the winter woods. Other Activities: Snowmobile Trail outside your door Skating on the pond. Ski: We are 20 minute away from MT Abram, ski area.